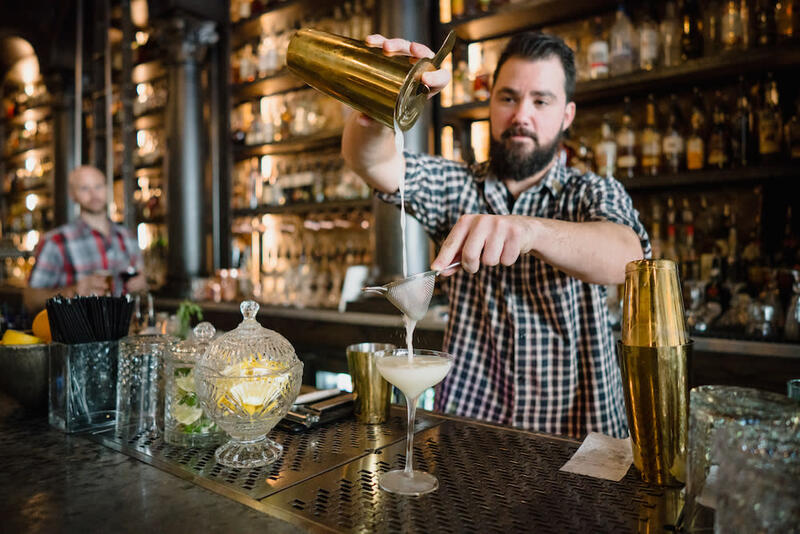 It wasn’t long ago that Salt Lake’s cocktail scene amounted to little more than cheap gin and tonics or quick rum and Cokes. (A couple of upscale cocktail spots were ahead of their time—see The Vault at Bambara and The Red Door.) Luckily for us, things have changed. Craft cocktail bars abound, from speakeasy-inspired hideaways to vibrant indoor/outdoor hangouts. 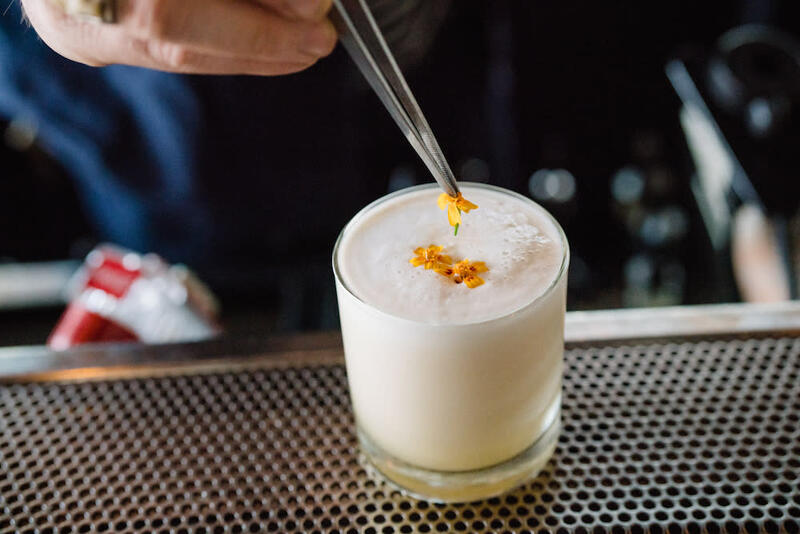 In alphabetical order, here’s a list of go-to spots for expertly mixed spirits. 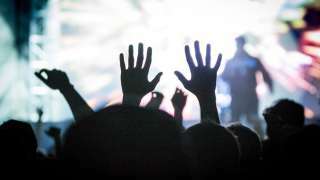 And while most of them offer small bites or more, these premises are all “LICENSED AS A BAR, NOT A RESTAURANT,” so you don’t have to order food to drink at them. 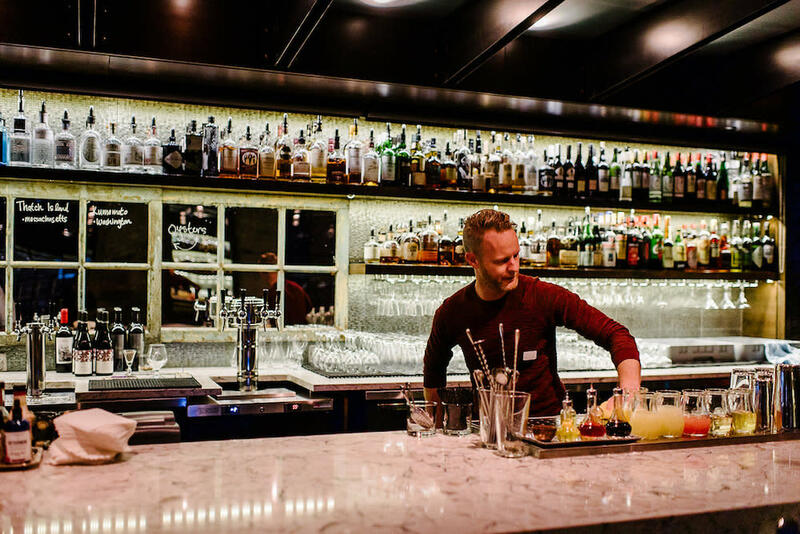 BAR-X really marked the turning of the tide in Salt Lake’s cocktail scene. 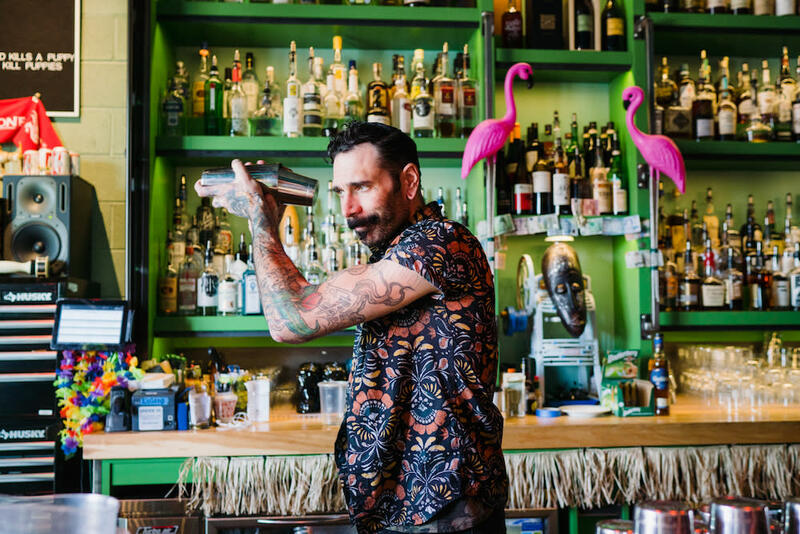 Once a dingy dive bar, Bar-X was purchased by Ty Burrell and completely remodeled in 2010, and now serves some of the best cocktails in town—try one that features the spicy handmade ginger beer (like the Moscow Mule or Pimms Cup). Small and dark with a secret back room, Bar-X purposefully retained a touch of its formerly seedy, speakeasy vibe while adding a heaping layer of timeless style, complete with classic black and white movies on the small corner television. This hip cocktail joint is always busy on the weekends, often with standing room only. Our favorite post-cinema cocktail spot sits on the corner of Broadway and Edison, a few quick steps from Broadway Centre Theatre, preferred destination for indie-flick and arthouse-film viewing. The featured cocktails here are always on point, and the modest bites-and-dinner menu will satisfy any late-night snackiness. 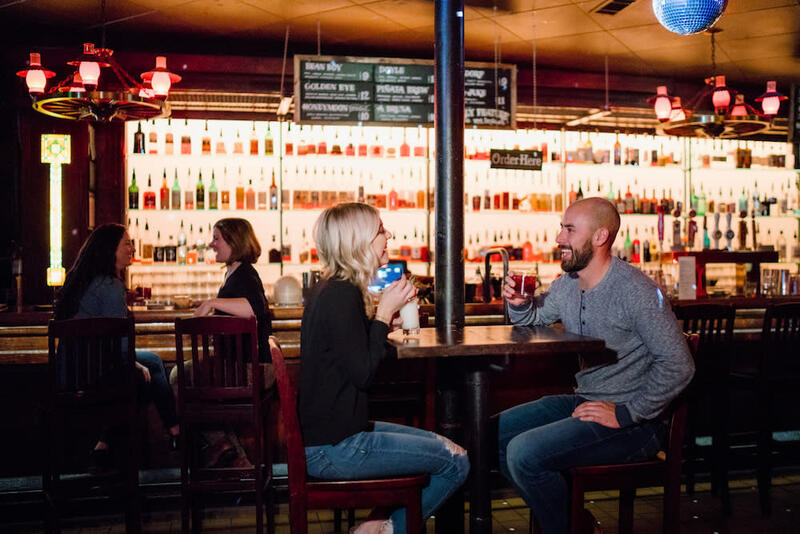 A small bar with stools, several comfy booths, and a row of two-tops make this a great spot for good conversation and long-overdue meetups. On a tour de cocktails? Copper Common is just a block away from Bar-X. 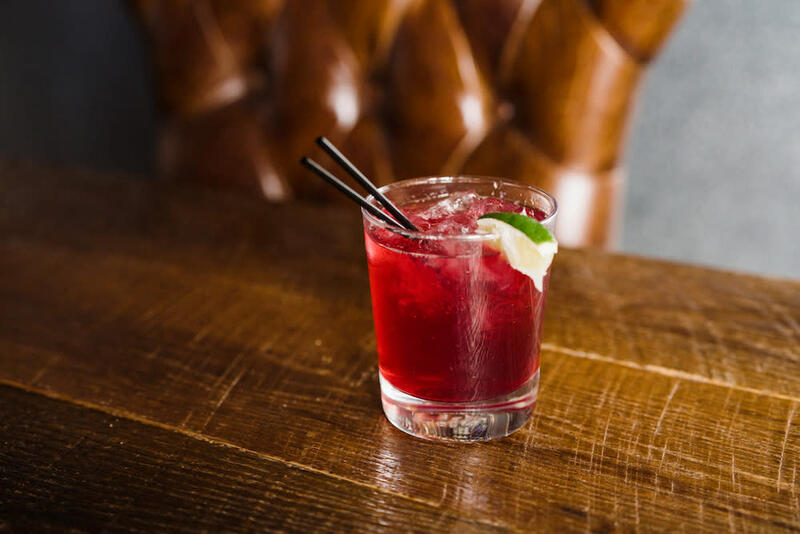 A new addition to the cocktail club, Lake Effect is swanky and trendy—the type of place you might run into a local NBA celeb or MLS hero. 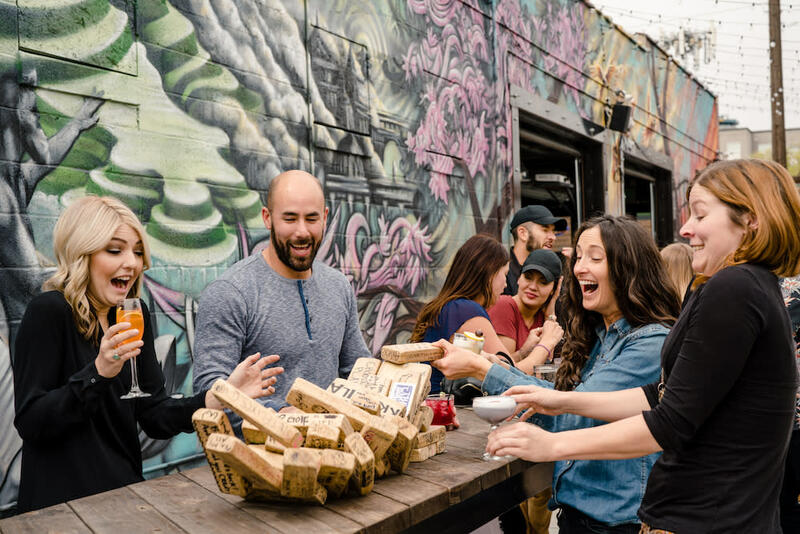 Lake Effect is where folks to go to be seen on the weekends or to grab drinks after a Broadway show or ballet. The decor is plush-meets-industrial, and the Spanish-inspired menu includes entrees and small bites. Another recent appearance on the craft cocktail scene, Purgatory is especially enjoyable in the warmer months. Its large patio, complete with outdoor games, has a super-social vibe. The indoor space is close-quartered, with a small bar to belly up to, top-notch cocktails, and a tasty, some-may-say bougie Japanese fusion menu featuring such delights as pork belly nigiri and soba noodles. The cocktails are fun and surprising without sacrificing sophisticated flavor. Try the White Russian Hacks, featuring espresso whipped cream and coco puffs. The Rest remains a bit of a locals’ secret, largely due to its hidden location. The street-level Bodega, a small bar with limited table space and a humble beer and cocktail list, serves as the “cover operation” for The Rest downstairs, a cavernous, bohemian underground space that truly feels like it’s getting away with something. 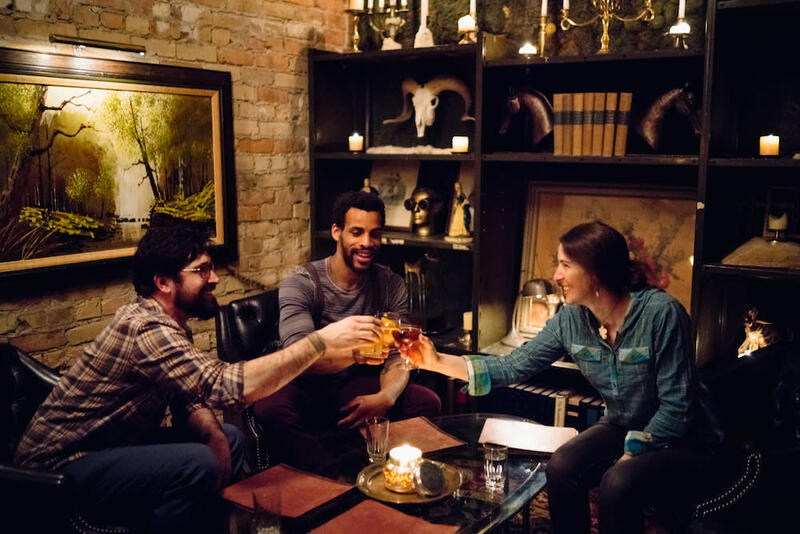 This is a great speakeasy-inspired spot to grab a drink or a bite while waiting for a table at Takashi (though The Rest’s dinner menu might make you consider changing your dining plans). We recommend nabbing a seat in the library room if cocktails are your main objective. The Sugarhouse neighborhood’s foremost cocktail bar, Ruin is situated in an up-and-coming dining and shopping nook on an unassuming sidestreet. Furnished with minimalist mid-century modern tables and chairs, leather couches, and industrial lighting, Ruin is hip and stylish in an understated way. The bar has a good selection of whiskey and scotch, and the educated, helpful bartenders will be happy to mix you your favorite classic cocktail or suggest something new. Need something to soak up the spirits? Try a panini. This classy yet laid-back establishment rounds out the central 9th scene. The bar attracts a hip young crowd, especially on the weekends, when a solid DJ gets the little dance floor going. 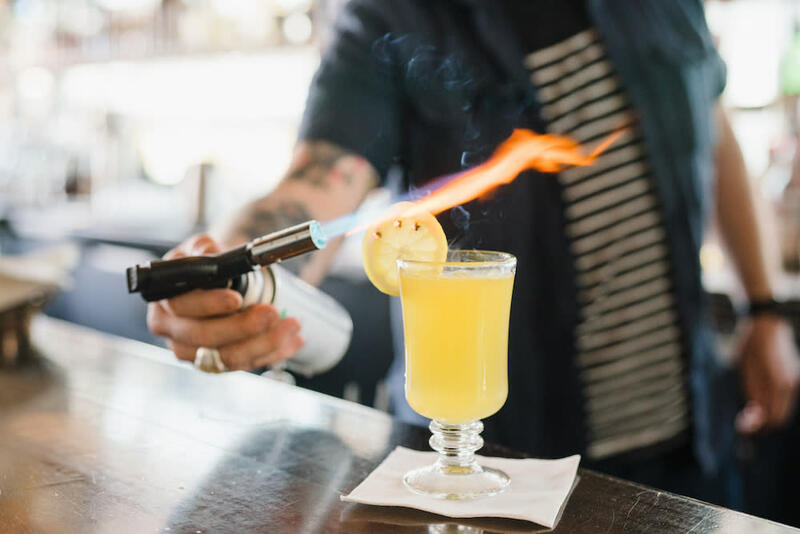 Tinwell has a bit of everything: a variety of seating options, from a long bar to high-top tables to round booths; a small patio; lawn games; a fire pit outside; and last but not least, flavorful and thoughtfully presented drinks—try the Coal Miner’s Daughter with candied ginger. Sister bar and next-door neighbor to the now-renowned seafood dining destination Current Fish & Oyster, Under Current is a moderately sized, sophisticated space perfect for a pre-dinner-date drink, a post-work cocktail, or an intimate birthday toast. The crowd leans well-dressed professional, and the cocktail menu features several absinthe-based concoctions that pair wonderfully with the fresh oyster selection. If that doesn’t float your boat, try a negroni and a shared charcuterie plate. This tiny, hidden little bar is adorned with gorgeous tile and artwork, and to extend the effect, the cocktails are as aesthetically pleasing as they are delicious. Some words to have in mind before ordering a drink: smoky, savory, sour, sweet, spicy, fruity, salty, bitter, dry. Water Witch offers a nice list of quality spirits, but no cocktail menu, so be prepared to describe your taste preferences to the bartender and roll the dice (you won’t be disappointed). Or feel free to order something more tried and true, like a gimlet or an old fashioned. Before it was changed to Main Street in the early 20th century, the stretch of road this bar calls home was known as "Whiskey Street," where gentiles went to get their fill of the brown stuff. Whiskey Street features exposed brick walls and a back bar accessed by library ladder. They’ve crammed all the seating they can into this long, narrow space, which means it’s not the place to go on a weekend if you require a substantial personal bubble (weekdays are more mellow). Obviously, whiskey is the name of the game here, but all the cocktails are on point—try any of the featured mules for evidence. And the food is as big a draw as the drinks: Guinness pancakes for brunch, pork belly cuban for lunch. Like its sister establishment Whiskey Street, White Horse is the place for cocktail lovers and "bar food" haters. 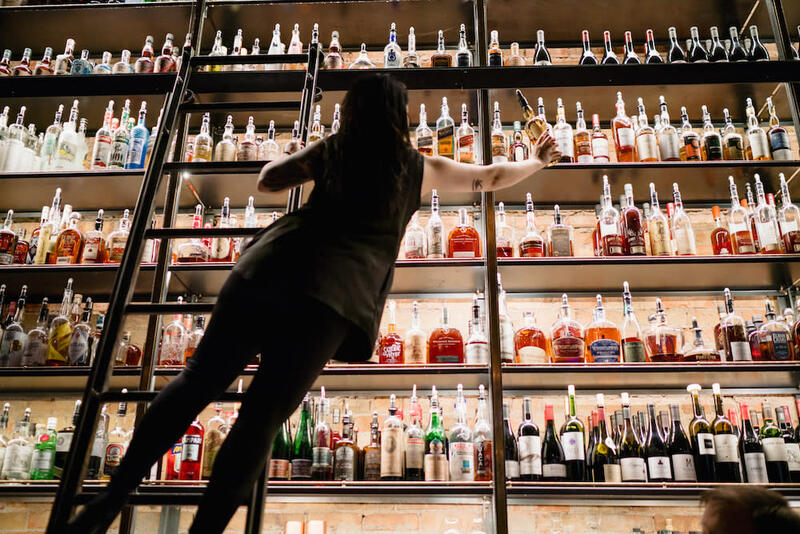 Sandwiched between Whiskey Street and Bodega/The Rest, White Horse aims for a somewhat more grownup ambiance, with its airy dining area, tufted booths, and marbled granite bar with rows and rows of top-shelf bottles glittering behind it. 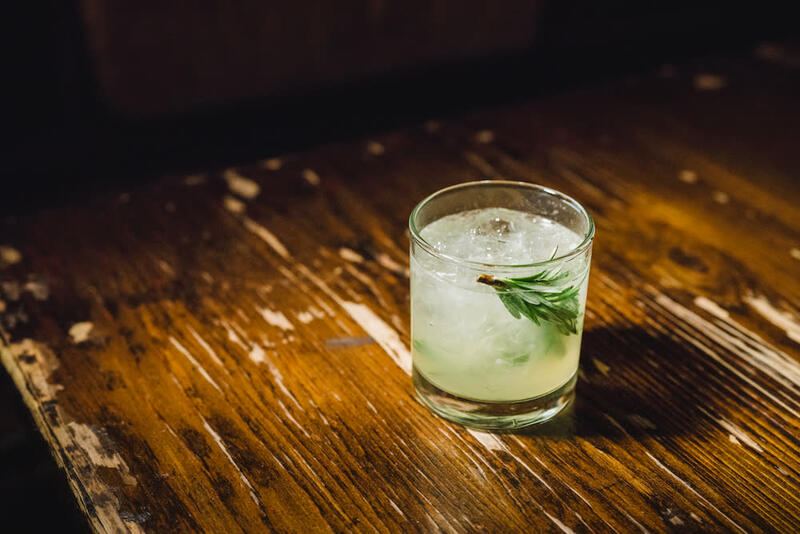 White Horse doesn’t take itself too seriously, though—try the Jamaican Me Drunk, featuring rum and ramazzotti. Foodwise, the shishito peppers, the roasted Brussels sprouts, and the lemon buttermilk tart are all fantastic nibbles, and the duck breast or the American Wagyu burger will leave you not only full, but fulfilled.